Download a disk image from http://jevois.org and flash it to a MicroSD card. 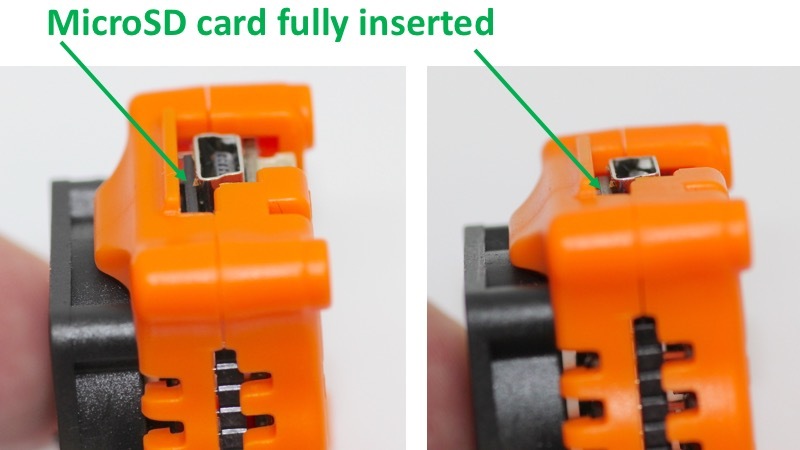 Insert MicroSD card into JeVois smart camera, with the MicroSD contacts pointing up as shown below. Connect camera to a host computer. The smart camera requires up to 3.5 Watts of power, which is above the limit of what a single USB 2.0 port is designed to supply, but is within the limits of a single USB 3.0 port. It is important to use a high-quality USB-to-miniUSB cable that can carry that full power without loss. Look for a cable with 24awg power wires. It is recommended that you use a USB 3.0 port on your host computer, as those provide more power. If that is not available, you can use a USB Y-cable to connect to two USB 2.0 ports on your host computer, or to one USB 2.0 port and one external USB power supply (e.g., phone charger). Make sure that you do not use a USB hub, unless that hub has a strong external power supply (transformer, wall adapter). Green: Power is on and is strong enough. After about 3 seconds: Flash orange: The camera sensor chip has been detected and initialized. After about 5 seconds: Solid orange: The smart camera is ready for use. Wait a few more seconds for your host computer to detect the camera and prepare itself for video capture. guvcview will remember to not try to use sound (-ao none) next time you open it. Next time you can start it from the Ubuntu menu without requiring a terminal. The pixel_format values supported by JeVois are (see User guide to video modes and mappings for more information): 'yuyv422' for YUYV, 'gray' for GRAY, 'rgb565' for RGB565, 'mjpeg' for MJPG, 'bgr24' for BGR24, and 'bayer_rggb8' for BAYER. Note that on Raspberry Pi 3, display framerate may be slow, especially if you are in power saving mode (small yellow lightning bolt shows up in top right corner of the screen, indicating that power supply is too weak to allow the Pi to run at full speed). Make sure you use a strong USB charger to power your Pi (e.g., with 2.1A output). The Raspberry Pi is just a little too slow for real-time video capture and display. 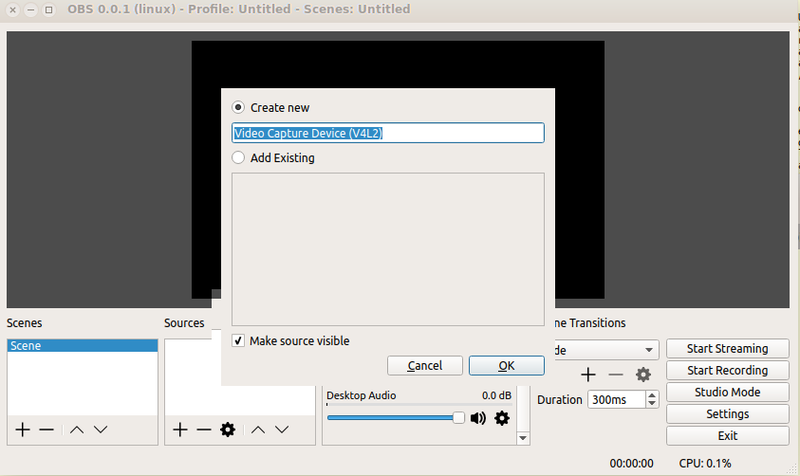 Use of a faster Linux desktop computer is recommended for optimal video performance. Feel free to play with the controls (brightness, contrast, etc). They should all work in guvcview. Remember that some controls are dependent over other controls, as in any USB camera. For example, "Exposure (Absolute)" will remain greyed out until you turn "Exposure, Auto" to "Manual Mode". 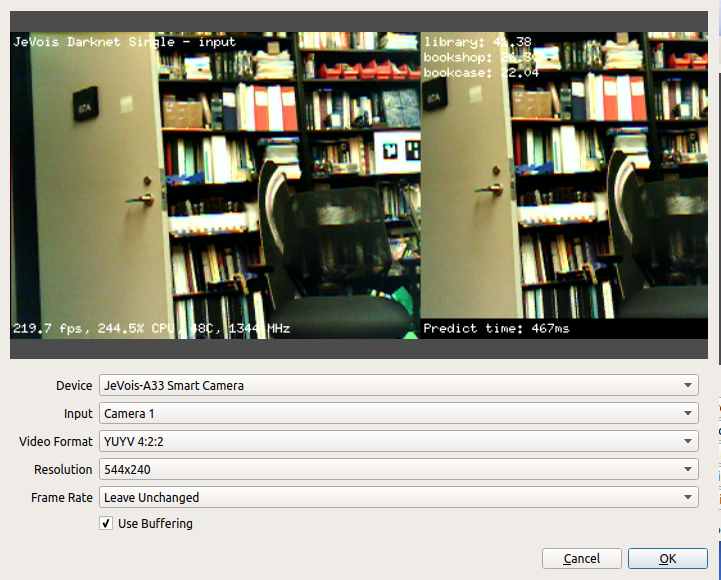 Make sure you quit your camera viewing software before you unplug your JeVois smart camera. Otherwise your host computer may become awfully confused trying to use a camera that does not exist anymore. No shutdown procedure is needed before powering off your JeVois camera. Just close your video capture software and unplug the camera. Open Broadcaster Studio is another great free program that allows you to select different video resolutions, as needed by JeVois. Connect JeVois to your computer and allow it to start up. 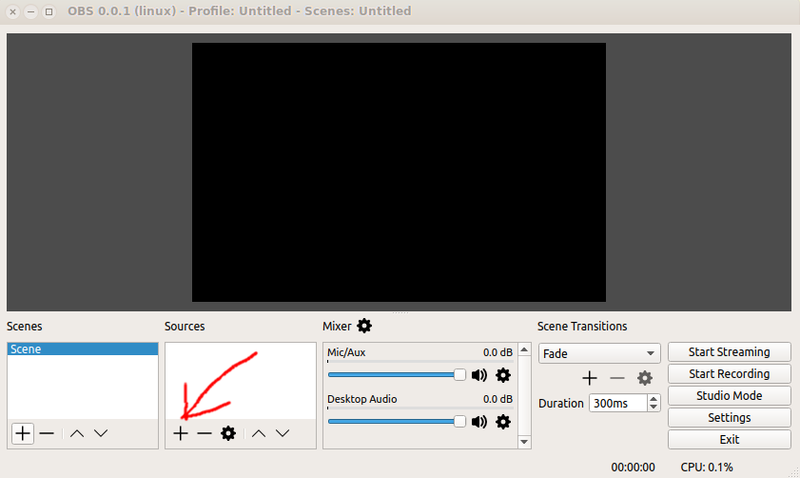 Open OBS Studio (just type obs in a terminal or find in in the Ubuntu menu), towards the bottom left of the screen, click the + icon under Sources to add a new video capture device (V4L2). Select the Jevois-A33 Smart camera as its device if you have more than one camera, and you will see live video from JeVois. Frame rate: either pick Leave Unchanged or pick one of your choice. Enjoy! You can drag and resize the video preview for best viewing experience. You forgot to insert the microSD card into your JeVois camera, insert it and try again. Your microSD card contains incorrect software. Try to flash the software again. You started guvcview too early, your computer has not detected the JeVois camera yet. 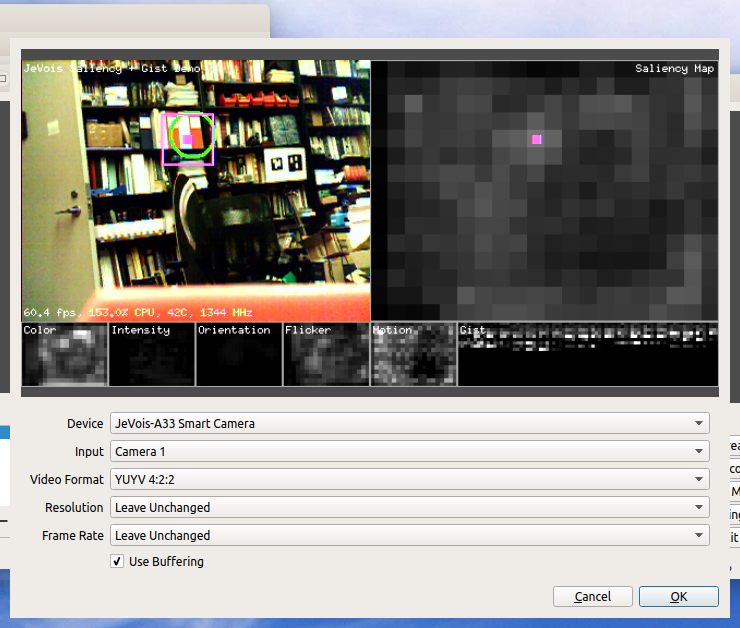 The smart camera boots in about 5 seconds, but it may take a few more seconds for your host computer to discover the camera and to configure itself for it. Your host computer has experienced too many USB connect/disconnect cycles and is confused. Try rebooting it. You are trying to connect your JeVois camera through a bad USB hub. Try connecting directly to a USB port on the mainboard of your computer. and then try to connect your JeVois camera again. 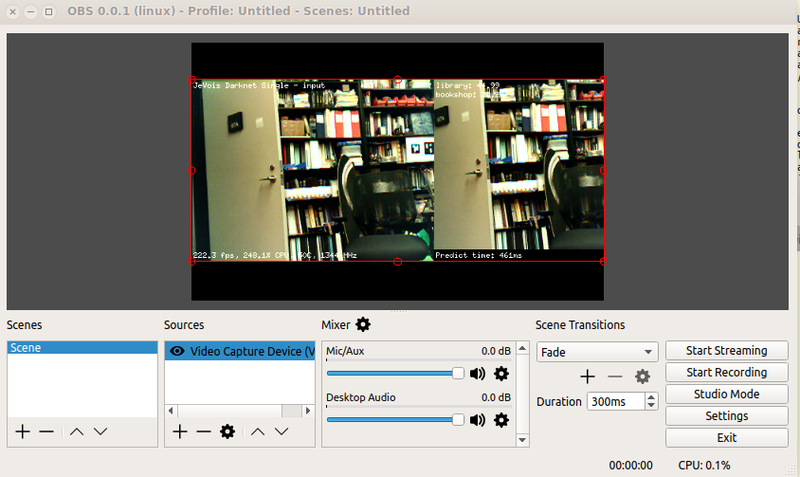 On Linux, the first connected camera is /dev/video0, the next one is /dev/video1, and so on. Will start the saliency + faces + object recognition demo.